Shaun Gerring, Assistant Superintendent at Green Acres Golf Club, situated on the banks of the Yarra River in the eastern suburbs of Melbourne, has been nominated as the top performing student on Melbourne Polytechnic’s Diploma of Sports Turf Management. As a result of this achievement, he has been awarded a place on Jacobsen’s Future Turf Managers’ program, to be held in May 2016 in Charlotte, North Carolina. 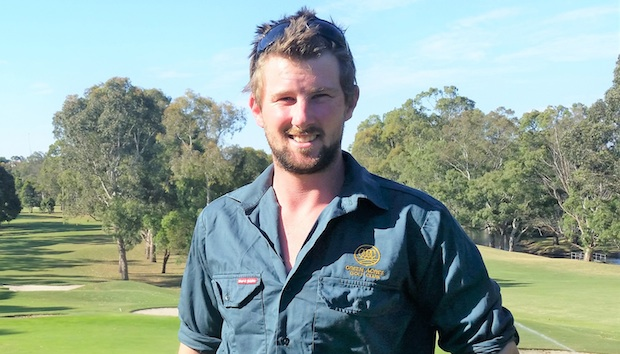 Shaun began his career at Albert Park Golf Club as an apprentice greenkeeper in 2004. Albert Park Golf Club is situated just 2km from Melbourne’s busy commercial business district, adjacent to the Australian Formula 1 Grand Prix circuit. He joined the Green Acres greenkeeping team in 2008. Jacobsen, the manufacturer of golf course maintenance equipment with plants in the USA and UK, has a three-year agreement with Melbourne Polytechnic – formerly Northern Melbourne Institute of TAFE’s (NMIT) – to provide new equipment for use on the five golf courses managed by the Institute. Included in the agreement is an annual scholarship for the college’s top performing student to travel to America and take part in Jacobsen’s Future Turf Managers’ Programme (FTM). This programme sees similar top performing students from major US colleges being invited to Jacobsen’s headquarters in Charlotte, North Carolina for a week-long training, mentoring and networking event. “Shaun is very conscientious with an excellent work ethic. He is determined to excel in his chosen career and is committed to continued professional development to ensure that he has all the skills ready for the day he becomes a Superintendent.